Dashboards: an under-appreciated tool with tremendous potential. In fact, a well-constructed dashboard can provide so much more than information visualization—it can help scientists and engineers quickly sift through important information to make well-informed decisions on the spot. Download the recording to learn more about the importance and utility of dashboards—and see how JMP makes dashboard building easy. Data experts Ian Cox and Daniel Valente of SAS lead an insightful discussion, using case studies to demonstrate some of the most current thinking on creating dynamic dashboards. They demonstrate how, with JMP, you will have access to a complete workflow for building dashboards, from data access and cleanup to model-building, data visualization, organization and sharing. Set up data queries that provide you with access to exactly the subset you want to explore. Use a single interface to shape and pre-process data. 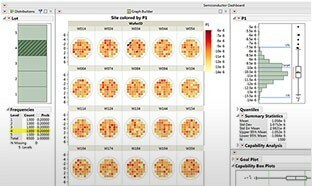 Generate and customize a range of dynamic visualizations to help identify patterns and outliers. Quickly separate data into signal and noise. Construct detailed workflows specially tailored to your data needs. Concisely convey key findings and solutions to decision makers. You’ll leave the recording with a better understanding of how customized dashboards can streamline data analysis and sharing. And you’ll gain a firm understanding of why a tool like JMP is a must-have for organizing and customizing critical workflows. This recordered seminar will be of interest to scientists and engineers across all industries who want to help decision makers sift through data to make informed, strategic decisions. Keep tabs on Explorers events in your area and online with #JMPExplorers.